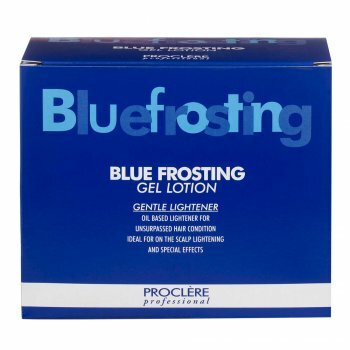 Proclere Blue Frosting Gel (50ml). The oil based formula is gentler than a powder bleach and more effective than high-lift tint and only requires 6-9% developer to achieve maximum lift. Includes 6 per packet for extra value for money. It features a gentle oil based lightener for a gentle ‘on and off’ application to the scalp, which increases client comfort.